Avenged Sevenfold News: M.Shadows: "That’s never gonna happen, but..."
M.Shadows: "That’s never gonna happen, but..."
REVOLVER: Is preparing for Mayhem any different than preparing for one of Avenged’s usual headlining tours? 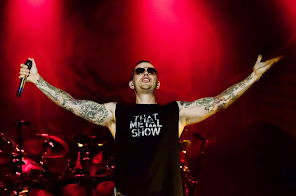 M. SHADOWS: It’s weird, because when you do a Mayhem or an Uproar tour, you don’t get to do your full 16-18 song headlining set list. So I guess our biggest concern right now is figuring out what we’re going to play, and how we can change it up every night. There’ll be a chunk of everything: If we’re doing stuff from Waking the Fallen, maybe we’ll do “Chapter Four” and “Second Heartbeat” one night, but the next night we’ll play “Eternal Rest” and “Unholy Confessions.” For City of Evil, we’re bring out some of the deeper cuts in there, so that people don’t have to hear “Bat Country” for the 100th time. [Laughs] One of our biggest concerns is making sure that everyone’s happy. That’s never gonna happen, but we’re going to do our best.